Ever since the season eight premiere of Game of Thrones aired this past Sunday, we’ve been learning tons about all that Kit Harington has endured while filming this intense final season. Not only did he nearly lose a precious part of his anatomy while filming those dragon-riding scenes, but apparently, Harington also gagged while filming kissing scenes with Emilia Clarke. We understand it’s weird kissing your friend of nearly a decade (and someone who is also dear friends with Harington’s wife, GoT alum Rose Leslie), but does Harington have to be so melodramatic about it? In a new GoT behind-the-scenes featurette released by HBO following the season eight premiere, fans were able to see how some of the most pivotal scenes from the episode came together. One of those scenes was the one immediately following Jon Snow (Harington) and Daenerys Targaryen’s (Clarke) dragon ride together. 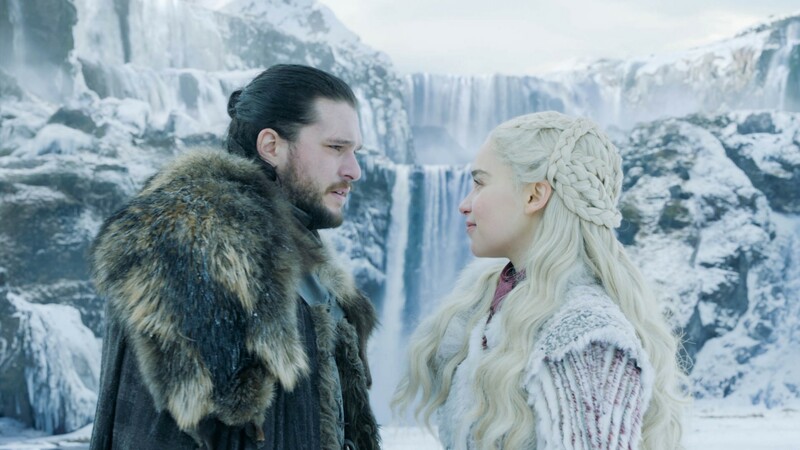 In the scene, Jon and Daenerys stop near some snow-covered waterfalls for a romantic chat about their future. The scene ends with some flirtatious banters and a kiss. The featurette reveals the scene came together thanks to the magic of a green screen, with Harington and Clarke filming in front of it before being digitally placed into the waterfall exterior shot, which was filmed in Iceland. What the featurette also shows (around the 13:45 mark) is Harington and Clarke actually filming the scene and breaking for a sec, making a horrific gagging noise in the process. Oof. In the show, it’s known that Jon and Daenerys are not only likely going to become a power couple, but they’re also nephew and aunt. The season eight premiere makes this information known to Jon, but Daenerys is still in the dark. It will be interesting to see how it all plays out, but we can guess for sure that there will be plenty of kissing scenes between these two going forward. If that’s the case, let’s hope Harington was able to muster through filming those moments without making that awful gag noise.